This dog appears to be up for sale hope someone in the US can buy him. We have a 2-year old Ellex son, Dagobert vom Salztalblick. He is totally focused and learning rapidly. Nice compact size and solid as a rock. I agree with Preston, and have therefore bred to him and the litter is great! Even at 4wks you can see the qualities starting to surface! One of the best temperamented, nicest looking, most correctly built working dogs there has ever been. He is very close to the standard with large masculine head, deep chest, short iron back, proper proportions, good angulations at both ends and good croup. This dog is a very worthy dog and is worth his weight in gold. 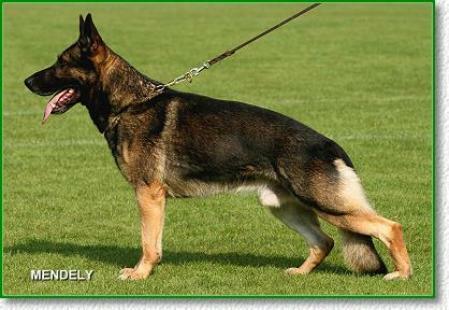 I hope those who want the "total German Shepherd" make use of him, as this is a rare opportunity. For you "working line" folks who think you have to breed to dogs that are unpleasing to the eye and not structurally in confirmation with the standard, well here is a dog that proves otherwise. Don't pass up this opportunity if you want excellent structure and proportions and superb working capacity. Here is a "working line" dog that is most pleasing to the eye!